Ah, the holidays… such a wonderful time of year to be stress-free, isn’t it? That is, if you call having to buy gifts for everyone during the busiest shopping season of the year stress-free. Not to mention all of the holiday parties where you’re forced to bring a dish to… who has the time? Well, this year, ChefUniforms.com has the answer to at least one of your problems. We thought it would be a great change of pace to offer some tips for healthy, easy-to-prepare, and (best of all) cheap dishes for this holiday season. Bruschetta: authentic Italian appetizer that doesn’t get any easier…top a slice of Italian bread with tomatoes, olive oil, garlic, and basil—viola! 2. Guacamole: avocados help lower cholesterol and regulate blood pressure, an added tip: mix in diced tomatoes for additional antioxidant power. 3. Veggies and hummus (or greek yogurt based dip): use the red and green veggie colors to your advantage to spruce up your veggie display! 4. Fruit and cheese plate: crowd favorite, try a fruit dip made from vanilla yogurt and cinnamon for a sweet kick. 5. Whole grain crackers and lean meats: pack a protein punch with lean meat slices (roast beef and turkey are generally lower in fat than ham). 6. Mini soup shooters: serve a veggie based soup like tomato or broccoli in small plastic cups that will be easier for guests vs. a spoon…soups are a great low-calorie way to warm & fill up. 7. Smoked salmon and whole wheat toast: salmon is a winner all around, it combines easily digestible protein and Omega-3 fatty acids to provide muscle, heart, and brain benefits. 8. Spinach quiche: use a whole wheat crust and a hefty heaping of this super-food (chock full of iron and calcium). 9. Low-fat bean dip with whole grain chips: legumes are a great source of fiber and protein, reducing cancer risks, improving blood glucose & blood pressure, and lowering cholesterol (no brainer!). 10. Bite-sized desserts: small portions allow guests to sample a couple different types of dessert while watching waistbands… an added tip: if the recipe calls for white flour, try ½ white ½ whole wheat…makes it healthier and the difference is undetectable! 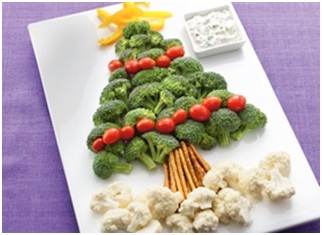 Do you have any favorite holiday dishes to add to our top 10 list? Share your thoughts below!